Any attempt of computer recovery starts up with the computer being shut down, and having the recovery DVD or a bootable DVD in the DVD ROM. You power on the computer and then you immediately press usually the F12. If you can use the recovery partition by pressing F11 usually because is easier than the DVD recovery. for your particular computer find the function key which will select the recovery partition at start up. You have to understand that: boot order, boot priority, boot sequence, boot configuration, startup sequence, startup configuration are synonymous expressions. Remember those recovery DVDs I was so adamant for you to burn? Well they will come handy now, especially if your hard-drive crashed and your recovery partition with it. The process of recovery always starts with the computer being in a powered off state, and the first recovery DVD in the DVD Drive. So start your computer up with the first recovery DVD in the drive. 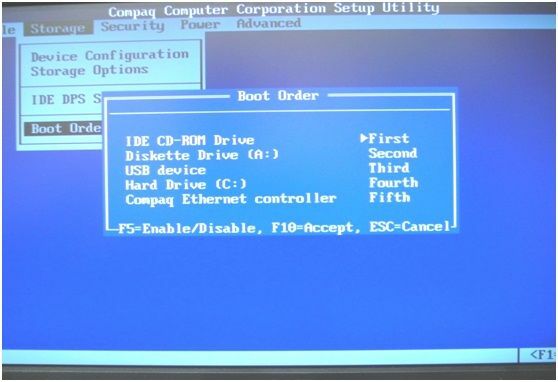 1) If the “Boot Sequence” or “Startup Sequence” has the DVD-ROM/CD-ROM set in the first priority then just insert the first recovery DVD in the DVD-ROM/CD-ROM and power on the computer. It should prompt you with the following screen or similar. After the Recovery Process is fully started you can select the recovery type you want. – In this case skip all the other bullets for this lesson and read: * After being presented with the recovery menu in the previous lesson. If you’re not prompted by the screen above, and no recovery process starts, that means that the startup sequence in not set in the desired order, therefore the computer did not boot of the DVD. Shut Down the computer and move to Step 2 below. 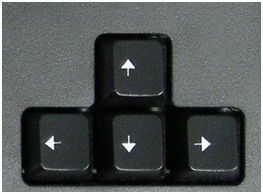 2) The other option is to press one of the functions keys while the computer boots on, usually the F12 key. This should prompt you with the devices we can boot from. Look at the example below. In the example below we have to select the IDE CD, CD-ROM, DVD-ROM drive. You use the arrow keys to move between devices, and the Enter key to make your selection. If this option works and you get prompted to boot from the CD/DVD? Then follow the instructions on the screen because the recovery process differs from manufacturer to manufacturer. If this option is not available, or just can’t get it to work, then you have to go at Step 3. 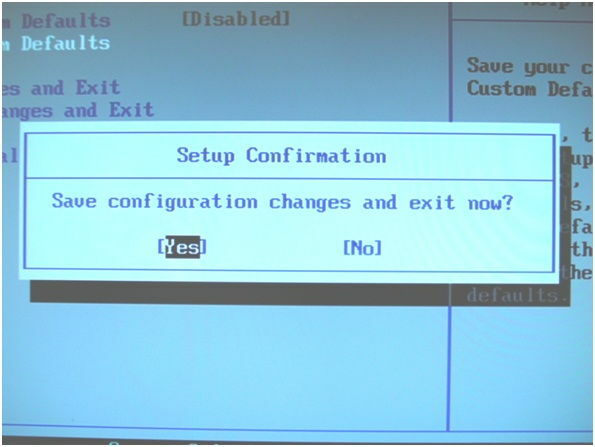 3) The third option is more involved and it requires you to change the first device in the boot sequence from which the computer boots up. For this you have to access the BIOS with one of the following keys (usually F1, F2, F10, and Del keys). 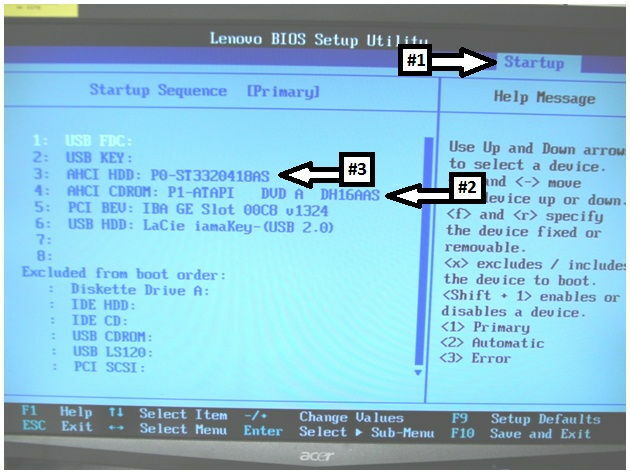 To access the BIOS you have to press the mentioned keys while the computer boots up, a second or two after powering on the computer. So power on the computer and press the keys. Press each and every one of them until you are presented with the BIOS. You will see how the BIOS looks in the following images. 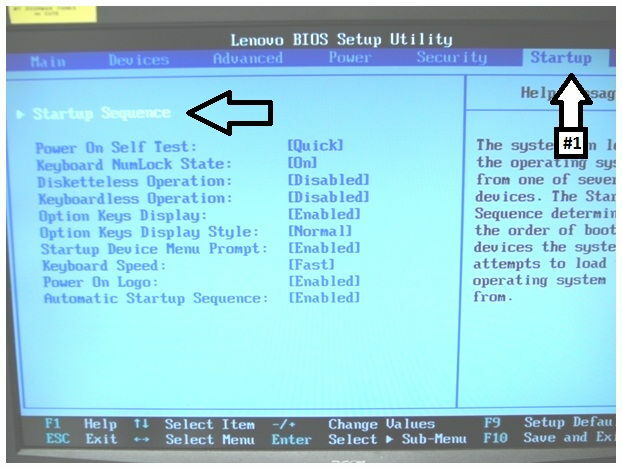 In the BIOS you have to find the (#1) Startup tab or the Boot Sequence by navigating with the arrow keys. You need to find the startup tab, Boot up sequence, Start sequence, boot order or something similar. Here the first device is probably the FDC or AHCI HDD or something similar. You need to change that in such a way to get the AHCI DVD-Ram as the first item. On the bottom of the screen there should be tips on what keys to use to move the devices up and down. These days you can use the +/- keys to move things, but make sure you press the Shift key in combination with the + key, if you’re not using the number pad. The Number Pad, has to be turned on from the NumLock key. Once you have the DVD ROM/RAM as the first device, you will need to save your settings. To get to the start up tab use the arrow keys. And press Enter to select the Startup Sequence Sub-Menu. At the bottom of the screen you can see the guide for the keys to navigate and change the BIOS settings. On the right hand side you can see the help relating the current menu. Don’t forget to look at the help whenever available. You are looking at a start up sequence. This one is a bit complex but with attention you should be able to change the AHCI CD-ROM (#2) from the 4th position to the 1st position. Of course this is just the picture for you to get an idea on how to boot of the DVD and not from the Hard-drive, which is (#3) the 3rd position. This BIOS is from a Lenovo machine. In addition you also need to know that if you change these settings, and then you install and recover your computer from the DVDs, you will still be able to boot from the hard drive even if the DVD is the first in the sequence. The way a computer boots up is really simple. It looks in the sequence and if it finds a boot sector it loads it up. If there is not boot info on the first device it moves on to the next one until all possibilities are exhausted. Go on to the next Picture to learn how to save the changes. For some reason the “F10” key is the only key that is universal to saving the BIOS changes. BIOS = (Basic Input Output System). Once you have set the proper boot sequence in place you should view the following message on the screen when you boot up from a bootable DVD. Return to the previous lesson (Recovering your computer from the recovery Partition):* After being presented with the recovery menu – The next lesson is an illustrated example of a recovery. But first return to the previous lesson as indicated to make sure you have everything in place. Continue to read and see more BIOS templates if you can’t get the Boot Sequence going. As you can see here the Boot Sequence or Startup Sequence has its own menu, therefore making it much more intuitive and helpful to work with. You can see further down that other BIOS versions have the boot sequence settings hidden under other categories. But in general all PCs today have a quick key for selecting the boot device without getting into the BIOS. A Sony Vaio BIOS. 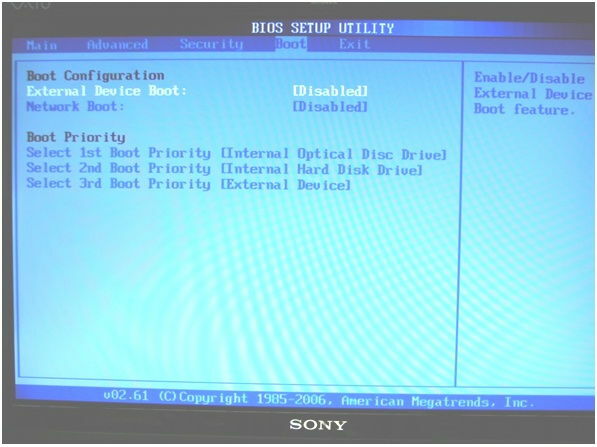 In the BIOS image above you can see under the boot priority that the first device is the Optical Disc Drive. There are two hints here that let us know that this is the DVD ROM or CD-ROM. One it is called Optical Disc drive and the second is called “Disc” a Hard Disk is spelled with a “K” instead of a “c”. An Optical Disc drive is usually a CD-ROM or DVD ROM. Recently Blu-Rays have been adopted in the market they also fall under the same category of optical disc drives. There might be some BIOSES that you can’t just figure out how to get in, usually because the assigned key is not common. Sometimes there is quick screen of information and it quickly disappears. 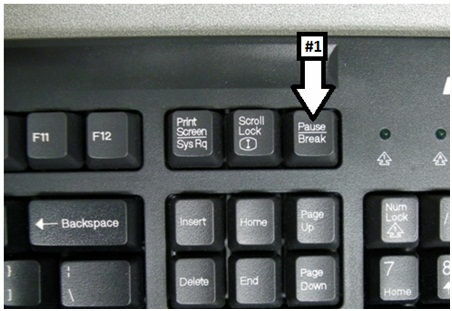 There is a button on your keyboard, called Break/Pause. (#1) If you press that in a timely manner you will stop at that screen and you will be able to read the information. This way you will be able to find the designated BIOS key. I hope this explains how to select the boot device and recover your computer from the recovery DVDs.